Should You Marry Someone With Debt? You’re in love!…but your significant other has debt (some student loan debt, credit card debt, car loans, etc.). So you are wondering: Should you marry someone with debt? Are you one of the unicorns? One of those people that never had debt…or worked incredibly hard to pay off their debt? If so, that’s awesome! But what do you do if you’re in love with someone in debt? The thought of going into debt for the first time…or for the second time… can be scary, unnerving, or feel downright crazy. I don’t blame you for feeling unsure of marrying someone with debt. Nobody would ever choose to go into debt. But you did choose your significant other, and sometimes, they come with debt. But should you marry them? Should you make them a permanent part of their life, and invite their debt to move in too? Are you on the same page with how to deal with their debt? This is important. If you aren’t on the same page with how to deal with their debt, your marriage is going to suffer. You need to talk to your significant other about money. There’s no way around it. Here are some questions that you guys need to discuss together. Do you both want to pay off the debt now? If so, how aggressive do you want to be with it? What method are you going to use (Debt Snowball Method, Debt Avalanche Method, or a customized plan?). Are you both willing to create a written debt payoff plan? In other words, does their attitude about their debt align with yours? After discussing these things, if you are the same page, then great! But what if you aren’t? What if you want to pay off this debt ASAP but they are okay with just making minimum payments? Well, that’s not going to work. Make a plan to pay off this debt that you can both agree on. You both may need to compromise. Do you both agree not to get back into debt? This goes along with the second point: Are you guys on the same page financially? If your significant other had a lot of credit card debt, are they willing to toss the cards away? Will you guys ever go back into debt? What about for a mortgage? Make sure you agree on when it is and isn’t okay to go back into debt. Are you going to feel resentful over this debt? Will you feel resentful over this debt? Are you going to willingly attack this debt together? Or are you going to drag your feet, complain, and make your significant other feel bad about this debt? If so, that’s not fair to them. Don’t marry them if you are going to make them feel like they’ll forever owe you, or be inferior to you, because they brought debt into the marriage. Are you willing to help them get out of debt? Once you get married, you’re a team. No one player is more valuable than the other. You have to work together and support each other to get things done. Are you willing to help your significant other get out of debt? Or are you going to leave them high and dry? You need to be willing to provide them with your full support. Otherwise, don’t get married. You have to be willing to sacrifice a little. After all, there’s a great present at the end – a debt-free life with the love of your life. 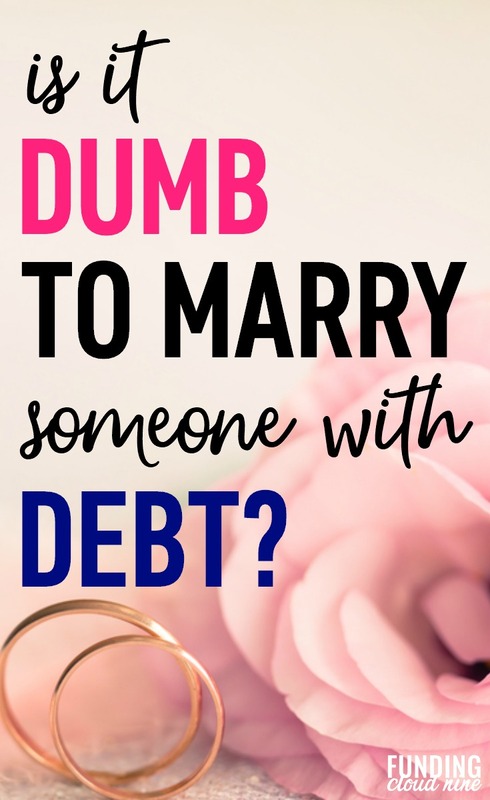 So, should I marry someone with debt? Heck YES…as long as you guys are on the same page with how to deal with the debt! Consider the debt the first thing you guys can tackle and conquer together as husband and wife. It’ll make you stronger. Don’t let money dictate every part of your life. But make sure you (and your partner) are making smart financial decisions together. You both need to have the same attitude and approach to dealing with the debt. Did you marry someone with debt? Or did you have debt and marry someone without debt? How did this affect your marriage? I was the one who had debt when I got married, and it caused problems with trust and a sense of security. Thanks for sharing Orlando. I’m sorry to hear that debt caused trust and security problems in your marriage (oh, how I wish money didn’t cause so many problems!). Did you talk about managing money and debt prior to getting married? I found that talking to my husband and making a game plan together was very helpful (and I think it was beneficial that we did this before we got married). It certainly didn’t solve all of our problems, but it helped that we both agreed on a plan and had the same end goal (living debt free).